The contest theme is The Future. What are your hopes and dreams - and fears for the future? See below for an expanded section on this year's theme. What is on the Verge ? 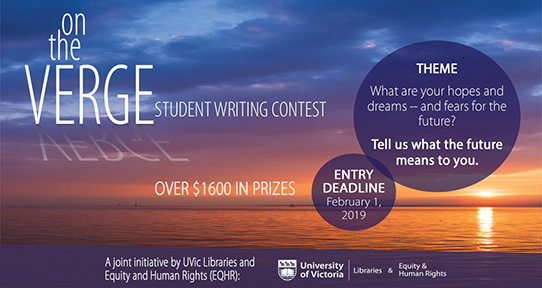 on the Verge Writing Contest showcases and celebrates emerging UVic student voices with an annual theme under the broad rubric of equity, diversity and human rights. As a reformulation of the 10-year running Diversity Writing Awards, we carry forward the spirit of diversity under a broader umbrella and with a renewed spirit of creative exploration. The contest is co-sponsored by UVic Libraries and Equity and Human Rights (EQHR) with significant support from other units on campus. Submit your entry with this form to otvcontest@uvic.ca by midnight on February 1, 2019. 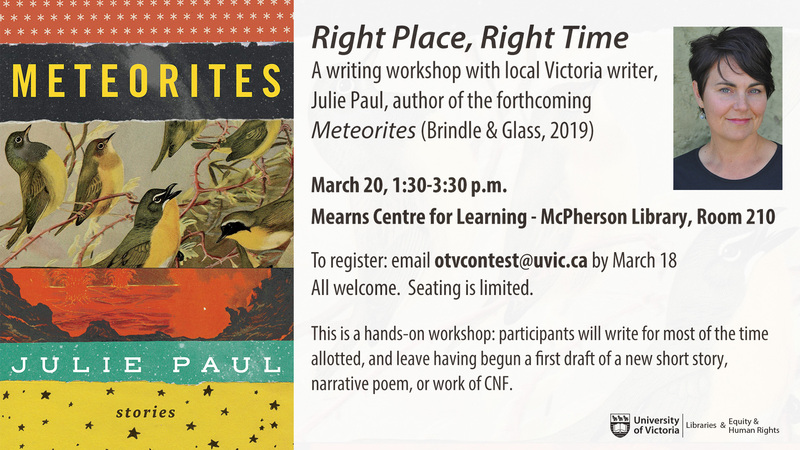 The 2018/19 celebrity judge is author Julie Paul, award-winning Victoria writer of fiction, non-fiction and poetry. The 2018/2019 theme is THE FUTURE. Theme description: Every day, we make choices and perform actions that impact our lived and shared experiences as humans on this planet. The past informs the present, and the present shapes the future. How do our social locations influence these experiences, or alter them? Can we change the future? And in the age of the Anthropocene, what does the future really mean? What are your hopes and dreams -- and your fears? Tell us what the future means to you. For more information email otvcontest@uvic.ca. A big thank you to the UVic Libraries, Equity and Human Rights (EQHR), VPAC and our fabulous Faculty and Departmental sponsors: Business, Continuing Studies, Education, Engineering, Fine Arts, Humanities, Human and Social Development, Law, Science, Social Sciences & the UVic Writing Department.